Waking up to this sort of view usually means one thing—widespread dust. And waking up on the day I took this shot I assumed exactly the same thing. But I was wrong. It wasn’t dust obscuring everything outside, but fog instead. 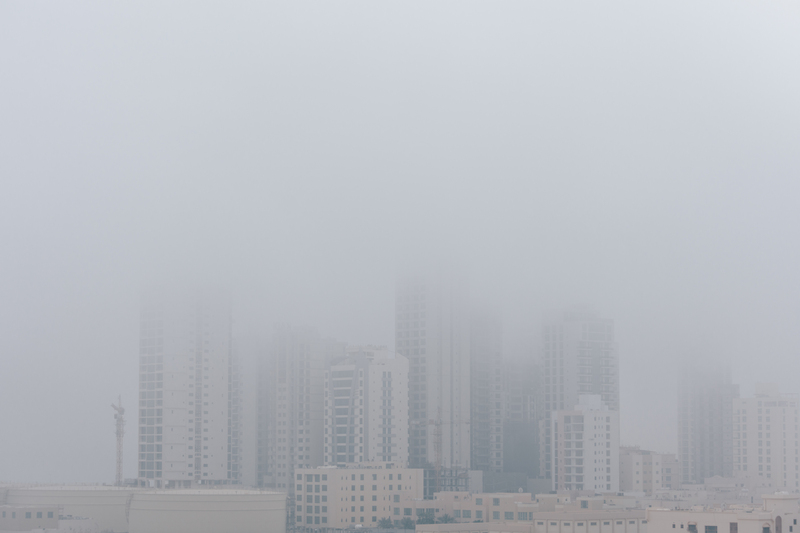 One of the densest, heaviest, most pea-soup like fogs I’ve ever seen in Bahrain. The kind of fog that makes even the usual busy streets of my neighbourhood sound quiet. Seeing even the smallest of buildings disappear into nothing as they rose up is a bit magical to me. Bahrain’s skyline is a busy one. So seeing half of it blend into the sky is something to see. Besides the only real weather we get in Bahrain is hotter than the sun, mild, and a few drops of rain. I’m letting myself get a bit whimsical over seeing a little bit of fog. By noon the sun had burned the fog right out of the sky and we were back to the normal sunny, blue skies.